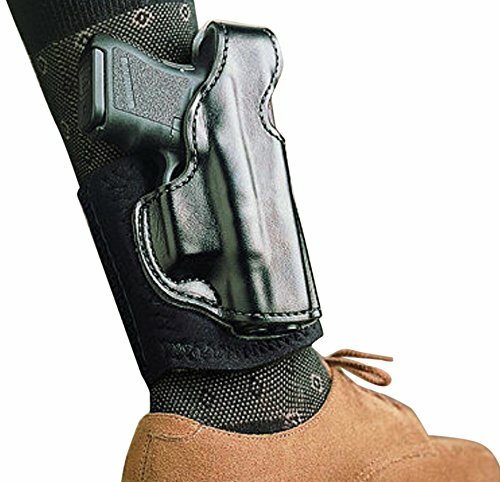 Ankle holsters offer a great concealed carry option you can use in the case of an emergency. These holsters are small, easily concealable, and they’re comfortable to wear. In the following article, we review 6 of the best ankle holster models available on the market in 2019, and we present their pros and cons. Are you new to concealed carry? Don’t worry, we got you covered. In the second section of the article, we explain how to determine which ankle holster is the right one for you. For : Glock 26,27,33,37,42 & 43. The Galco Ankle Glove is specially designed to fit the Glocks 26, 33, and 27. This ankle holster is made out of 100% leather, and it uses a wide neoprene band to wrap around your ankle. The neoprene is comfortable, and it uses a Velcro strap to maintain its position during the day. The neoprene band is long enough to accommodate ankles up to 13” in circumference, so most people will find it a perfect fit. This ankle holster is specially designed to fit Glocks, but it will also fit small revolvers and other semiautomatic pistols of similar size. Sticks To Your Leg – This is a very comfortable holster, and it will stick to your leg. After some time, you won’t even tell it’s there any longer, it’s so comfortable. If you’re looking for a simple and efficient ankle holster that doesn’t cost too much, you should take a closer look at the model produced by OutBags. This ankle holster is made out of neoprene and nylon, so it’s durable and weather-resistant. The holster comes with a 4-inch wide neoprene band that will wrap around your ankle. The neoprene band is long enough to fit ankles from 10” to 13” in circumference, and it won’t stretch over time like elastic bands. The band secures in place using a Velcro strap, and it’s 4 inches wide. Fits Many Pistols – The size of the holster will provide enough space to fit many types of pistols. Not Good For Slim Ankles – The neoprene strap only fits ankles between 10” – 13”. Make sure you measure your ankle before buying. Uncle Mike’s ankle holster is made out of Kodra nylon. This type of nylon is abrasion-resistant, and it’s also water-resistant, so it should be more comfortable and durable than other types of nylon. The holster is suitable for many small and medium handguns, and it can even fit some compact autos. The holster’s strap is made out of a soft knit fabric that’s comfortable to wear directly against the skin. The holster’s closed cell foam has a good quality, and it will act as both padding and moisture barrier. The Pro-Tech Outdoors ankle holster is a good solution if you’re looking for a concealed carry holster that’s cheap. 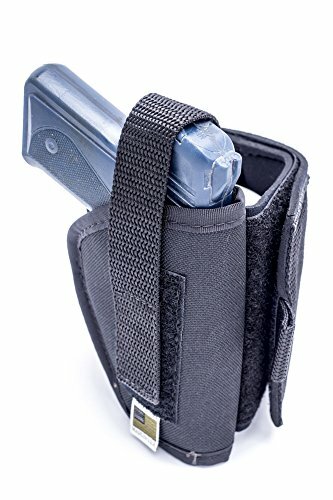 This holster is made out of nylon, and it uses a Velcro strap to secure the holster to your leg and another one to secure the handgun in the holster. The outer layer of the holster is actually made out of Cordura ballistic nylon. This type of nylon is more durable than the regular one, and it’s also water-resistant. The holster is double stitched at the pressure points, so you can be sure it will last for a long time. Stays In Place – The holster wraps around your ankle and doesn’t move when you’re walking or running. The Velcro strap is adjustable, so you can fit it to your ankle easily. Right Hand Only – This manufacturer doesn’t produce a holster for left-handed shooters. The DeSantis ankle holster is made out of top grain saddle leather and it comes with a thumb break. The band holding the holster against your leg is made out of neoprene, but it has a sheepskin lining for additional comfort. The leather holster has a strong PU coating on the outside, so it’s very durable. The holster has an interior lined with smooth leather, so it won’t scratch your handgun’s finish no matter how often you draw and holster it. The holster is also compatible with calf straps and boot extenders, but they have to be bought separately. Comfortable Fit – This ankle holster is very comfortable to wear, and once you adjust its position, it will keep it throughout the day. Not Good For Large Ankles – This holster won’t fit large ankles. The DTOM AH3 ankle holster will fit a lot of handguns, and it will even fit some pistols with laser attachments as well. 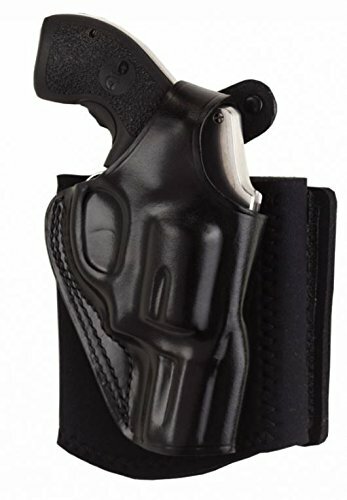 The holster is made out of nylon and neoprene, and it will fit ankles with a circumference of 10 – 12 inches. The neoprene band is comfortable, and it secures in place using a Velcro strap. The neoprene band is easy to wrap around your ankle, and the Velcro strap will secure it firmly in place. You can wear the neoprene directly against your skin without experiencing any discomfort. Finding the best ankle holster in the market might be more difficult than you think. There are a lot of models available, but not all of them are very efficient. In the following section, we present some must-have features you should seek in an ankle holster. One of the most important features you should look for in an ankle holster is comfort. If an ankle holster is not comfortable, the chances of you wearing it frequently are very slim, and you might end up not wearing it when it really matters. Not all ankle holsters are designed in the same way. One of the differences in their design is the support band. 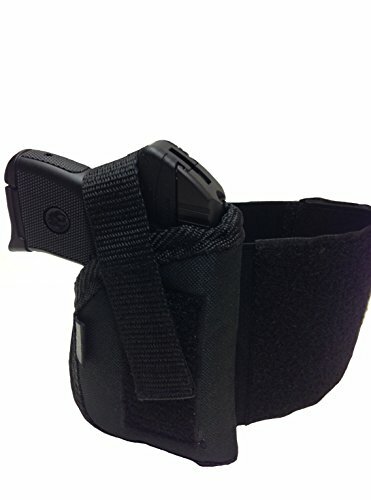 Most holsters nowadays use neoprene support bands because neoprene is durable but also comfortable to wear. However, some manufacturers still rely on elastic bands to support their holsters. The problem with elastic bands is that they’re very comfortable in the beginning, but they stretch and become inefficient after you wear them for a while. While neoprene bands are usually comfortable by themselves, some manufacturers go out of their way to improve your comfort. Some of them add an additional lining to the side of neoprene that comes in direct contact with your skin. The lining can be made out of sheepskin or other soft materials. Other manufacturers insert layers of foam inside the neoprene, so it will be more comfortable to wear for a long time. The foam will increase the holster’s comfort, but it will also protect it against moisture and shocks. The way the ankle holster maintains its position is also very important. A good holster will maintain its position without wobbling or sliding even when you’re running. To achieve this, manufacturers turn to different solutions. Neoprene And Velcro – This is the most popular solution manufacturers found to keep the ankle holster in place while you move. The neoprene band wraps around your ankle, and it’s held in place by a strap of Velcro. This is a popular solution because it’s easy to implement, and it’s also pretty comfortable. When shopping for a holster that relies on a neoprene and Velcro system, make sure you double check its strap length, and you properly measure your ankle’s circumference. Unlike other materials, neoprene doesn’t stretch so it won’t be more comfortable over time if you buy a measure too small. Nylon Straps – Nylon straps are also pretty popular, but fewer manufacturers seem to rely on it. The main problem with nylon straps is that they often have sharp edges. When you’re wrapping the holster around your ankle everything seems fine, but when you’re walking or running the edges dig into your leg. This can be very uncomfortable, so many manufacturers chose to turn to other solutions. Calf Straps – Calf straps provide a great way of making sure your ankle holster will stay in the same position when you’re wearing it. Calf straps connect to the ankle holster through a vertical strap, and they wrap around your calf at an adjustable height. The main advantage of using this type of straps is that they will redistribute the pistol’s weight over a larger surface, so your ankle won’t bear all of it by itself. This can increase your comfort, and it will also make the holster more stable while you move. One of the disadvantages of wearing these straps is that they can become uncomfortable after some time. If your legs sweat, they might chafe your skin. They can also interfere with the way your leg usually flexes, making them somewhat uncomfortable. You might be wondering if the holster’s material might influence the way you carry your handgun. Well, we already talked about how the type of support it offers influences your experience, now let’s talk about the holster itself. Leather – Even though it’s not very popular nowadays, leather is still used to produce ankle holsters. Leather ankle holsters are usually comfortable, and they are also durable. The leather often comes with a highly resistant finish that will protect it from water and other elements. One of the advantages of using a leather holster is that you can trust it won’t scratch your handgun. These holsters have a leather lining on the interior, and they will wrap around the handgun like a glove. They also usually come with a retention strap that will keep the gun safely in place. Nylon – Nylon is widely used for producing ankle holsters. The main advantage of nylon is that it’s cheaper than leather, so the end product will also be cheaper. Nylon holsters can be very good, but that depends on their build and characteristics. Some nylon holsters have reinforced stitches that will protect them against shocks and will increase their durability. Other models will use retention straps to keep the handgun securely in place. While most nylon holsters are comfortable to wear, some of them have rough edges that will dig into your ankle. You might be wondering if the price differences between ankle holster models are justified. Well, they just might be. Most of the times, leather ankle holsters will be more expensive than nylon ones. That’s understandable since the leather itself costs a lot more than nylon, and it’s also more difficult to manufacture. Drawing from your ankle holster is not easy, and you should exercise frequently to make sure you get the hang of it before you wear the holster. There is no accurate way to determine which ankle holster will provide a better draw, but here is something that might help. You should always make sure the holster matches your drawing hand. Ankle holsters don’t have an ambidextrous design, so the same model will have a special design for left-handed and right-handed shooters. Ankle holsters are a great concealed carry option, especially if you’re not a fan of the IWB or OWB carry solutions. This option allows you to carry your handgun at all times, no matter what season it is. Also we recommend you have a look at our buying guide for a shoulder holster if you have a 1911, or other holsters for your Glock. We’re certain that after reading our short buying guide, you’re able to determine which of the models we reviewed is the best ankle holster for your needs. Keep in mind that drawing from an ankle holster is not comfortable, and you’ll have to practice frequently to get the hang of it.